Our Baking Parchment can be safely used at temperatures up to 400 degrees Fahrenheit for baking pizzas, breads and buns, pastries and cakes of all types, bagels, croissants etc. Even sausages and sugar-loaded pastries can be baked without problems on our paper. Multiple releases from the same sheet of paper are possible. What are your advantages in using Amol's Baking Parchment? It is made from Pure / Genuine Vegetable Parchment, a very special hygienic paper of high purity and strength. The baking trays do not need to be greased or oiled. 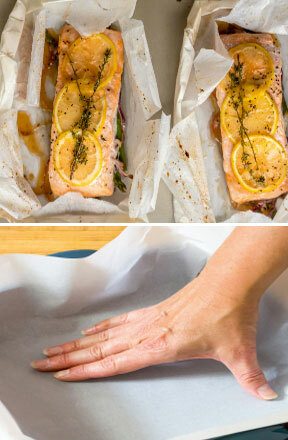 Simply line them with our Baking Parchment instead, thus substantially lowering the fat and cholesterol content of your cooking. It is stable under high heat loads. The special coating gives it excellent release, ensuring that the paper does not stick to the baked product. It is extremely convenient in cooking and baking - no more mess, no more cleaning greasy trays / pans. It is suitable for use both in conventional and microwave ovens. The low porosity and low moisture transmission properties also make Baking Parchment an excellent protective wrapping paper. Apart from standard supplies in reels and sheets, we can also supply Baking Parchment in custom made and printed retail / dispenser packs (with or without a cutting arrangement).